The Brook Street Band: [Pitch: a� = 415 Hz ] Marianna Szücs, Katalin Kertész, vv; Hanna McLaughlin, oboe, recorder; Tatty Theo, vc; Carolyn Gibley, harpsichord and chamber organ. Notes in English, Français, and Deutsch. Photo of the artists. It is a tremendous pleasure to be a reviewer when a disk like this comes along, as it does only a couple of times a year. Just to be able to listen from the first note to the last with all critical analyses beguiled, to be able to relax and enjoy while the performers and engineers do everything right. There is a perfect balance of brilliance and sweetness in the original-instrument tonality. I was reminded of an ancient Haydn Society monophonic LP recording which was my introduction to the Handel Trio Sonatas. That recording was unfortunately long ago spoiled and I have waited in vain for nearly 50 years for a recording to come along with the same magical balance of crispness, bounce, swing, sweetness and dignity; just the right amount of ornamentation on the repeats to add interest without getting cute. I found it almost impossible to sit still while listening, I wanted to move my body as I visualised the performers leaning into the notes, giving that perfect lilt to the phrase as found in great ballet music. The familiar fourth movement of the Handel Trio Sonata Op. 2, #3, was later used as the second movement of his Organ Concerto Op. 4, #2, HWV 290 (both in Bb). The concerto keyboard part contains imitations of string phrasing. Comparing the performances of the Corelli Opus 1, #7 is an all but impossible job. Both the Purcell quartet and the Brook Street Band are equally stratospheric in quality. It is like comparing gold and gold. The Purcells use lute continuo and play at a slightly faster tempo; the Brook Streeters use organ. The Purcells ornament just a little bit more. It is possible to say that the Brook Street group has a very slightly more varied tone and a tiny bit more drama. In the one-movement sonata Opus 2, #12, the Purcells use a basso continuo consisting of harpsichord and cello, and Brook Street Band use solo organ without cello. Again, the Purcells are slightly faster, the Brook Street Band every so slightly more luscious. The comparison of the Water Music recordings is a little easier. Hogwood plays the whole 38 minute Suite in F with orchestra. 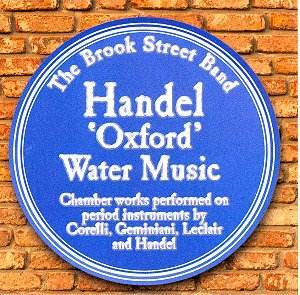 The Brook Street Band plays four movements only for a total of 7.11 minutes using three players�oboe, harpsichord, and cello�and the effect is as natural as if Handel himself had written it this way. The trio sonata transparency is just right for some of the Water Music pieces which to my taste have often sounded too thick as they are usually played; the doublings and harmonic reinforcements which were necessary for outdoor performance hardly need be indulged for chamber performance, and can be rightly forsaken. This work has earned the group the Byrne award from the Institute for Handel Scholarship. From the G minor Suite they play two movements (on recorder instead of oboe, adding a violin), and from the D major Suite, three (everybody plays in this one), for a total timing of 14.31. Obviously this recording, despite its title, will hardly stand in for a full length orchestral performance of this music, but probably most people already have one they like and can appreciate this fresh viewpoint on selected movements. The Leclair is completely unknown to me, but they play it with virtuosity and a clear sense of French style with the just the right amount of swing. The cello and first violin are actual period instruments, the others are modern copies. The sound is unusually clear, realistic, and undistorted; and it will open up nicely in your surround sound player.